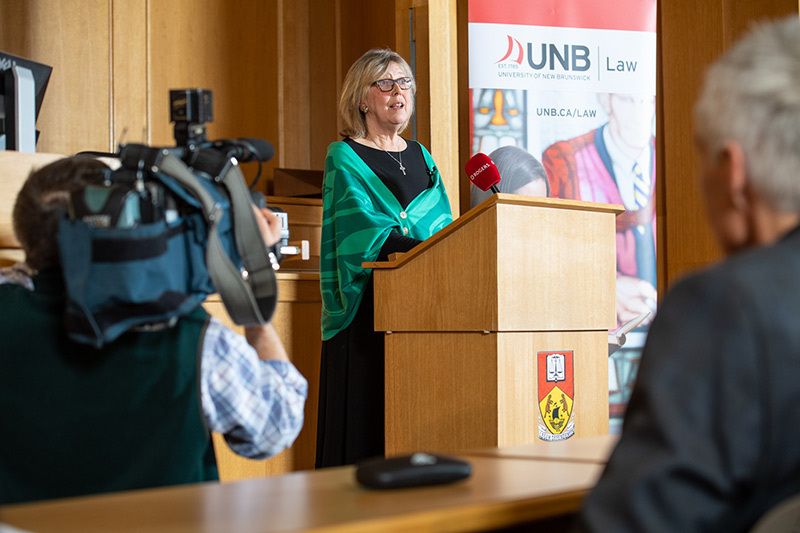 Elizabeth May, leader of the Green Party of Canada and its first elected Member of Parliament, delivered UNB Law’s Viscount Bennett Memorial Lecture on Feb. 14. Her well-attended lecture entitled, “One point five to stay alive – How we find hope and honesty in dangerous times,” explored the potentially devastating effects of climate change and how we can act to make positive change now. An environmentalist, writer, activist and lawyer, Ms. May graduated from the Schulich School of Law at Dalhousie University in 1983, and began her career working as the Associate General Counsel for the Public Interest Advocacy Centre. She has significant experience working with Canadian First Nations, was the first executive director of Cultural Survival Canada from 1989 to 1992, and served as executive director of the Sierra Club of Canada for 17 years. Ms. May began her career in politics in 1986 when she became Senior Policy Advisor to federal Environment Minister Tom McMillan. Over the next two decades, she took on a variety of environmental initiatives, including the negotiation of a number of new legislations on pollution control. In 2006, Ms. May became leader of the Green Party of Canada, and in 2011, made history when she was the first Green Party candidate elected to the House of Commons.